Hi there! Vicky here and I am so excited to share our card swap winners from the Edison, New Jersey Stamp and Scrapbook Expo. I am truly amazed at the talent across this beautiful country of ours. 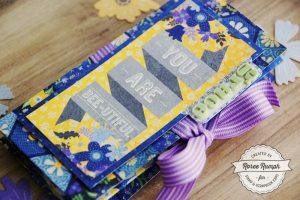 I know as a crafter and card maker myself how much time and energy goes into making each card. It’s always so exciting to see what you create! Our first card swap winners are a duo whose names are Lisa and Maddie Tubbs. How fun is this interactive gum ball card? 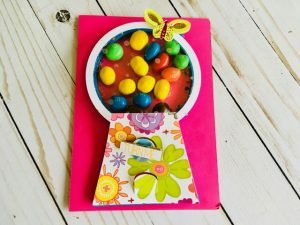 It is multi-layered with dimensional tape behind the circle which allows candy to be placed behind the acetate. I love the vibrant color choice and the little butterfly sticker on the right. It actually works, too! You just turn the circle and a piece of candy drops down, like a real gum ball machine. You are an amazing team, Lisa and Maddie, great job!! 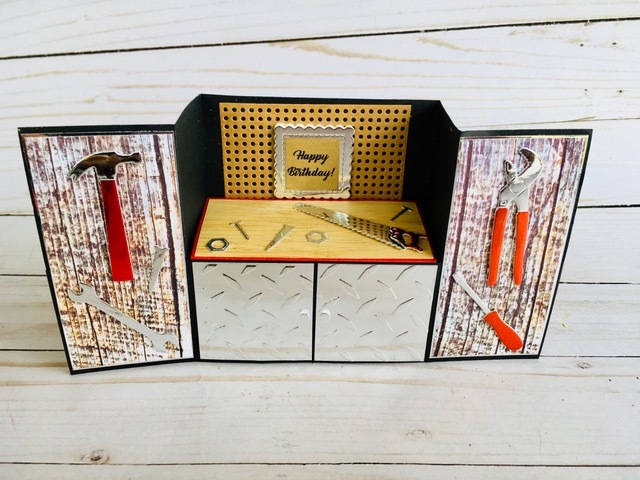 Our next winner is Susanne Alicea with this awesome tool-themed card. It folds flat but when you open it up and put the table down, the happy birthday sign (which is so cute) acts as a stopper to hold the table down. I also love the peg board die behind the sign because every workshop needs one. The silver paper is so realistic for the tools and also the embossed doors. 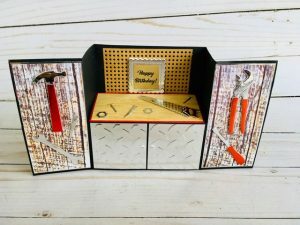 Can you imagine giving this to a loved one who loves working with tools? They would be absolutely thrilled! All I can say is, Susanne you hit this one out of the ball park! Stellar job!! 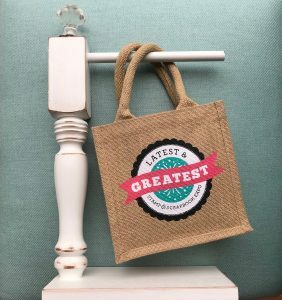 I hope you all enjoyed reading about these talented crafters in Edison, New Jersey. 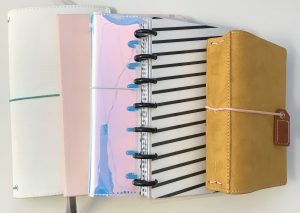 Remember if you, too, love making cards and enjoy swapping with others you have to come to our card swap next year. We would love to meet you and see your creations. Until then, have the best day and remember Vicky loves you! Such a stinkin cute card. Great job!